Boomchix are a harmony singin', roots rock band from Vancouver Canada fronted by founding members Janice (vocals/guitar/songwriter), and Barb (vocals/mandolin). With a sound and songwriting style that has been compared to artists such as The Indigo Girls, Emmylou Harris, Gillian Welch and Heart, they are a band that crosses the boundaries of genre defined music. Their sound is an alternative blend of country, bluegrass, rock, folk, and pop influenced songwriting, with insightful and lighthearted lyrics, highlighted by strong melodies and harmony vocals. 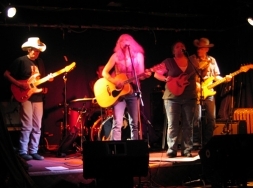 Their debut CD "Surprise Surprize", has been well received, and has established Boomchix as a favorite among Vancouver's Roots Rock music scene. Please visit them at www.boomchix.ca for more information, to hear high quality clips of every song, and for gig updates and current news.